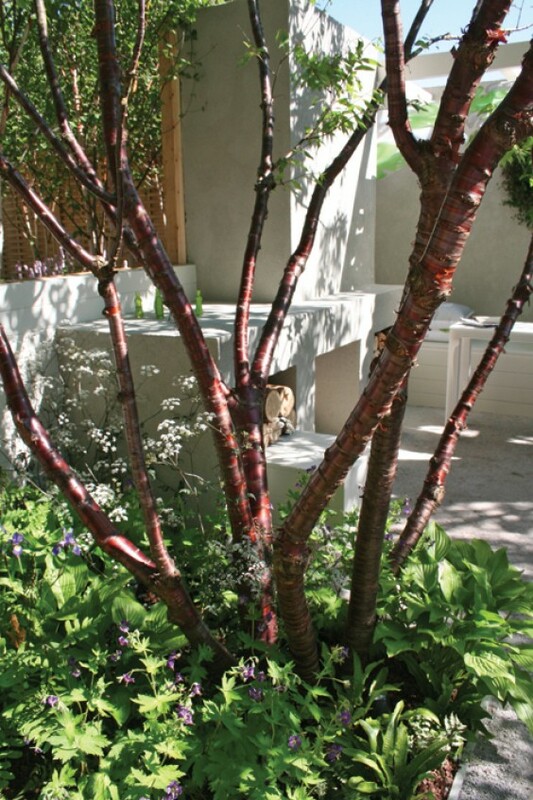 Even in a recession the Chelsea Flower Show seems to have got something right – it sold out in record time this year, and again there was plenty to inspire designers and gardeners at many different levels. With it being such a hot start to the week, especially on the day I visited, I decided to get in very early to allow time to get round the show and take all my photos before the heat really hit. So I was through the gate just after 7am and headed straight for Main Avenue where all the big show gardens are; photographers, journalists and the TV crews were already out in force. In the early morning light the woodland planting on Tom Stuart-Smith’s garden looked absolutely breathtaking. Tom has had a run of gold medals in the last few years and seems to win Best in Show on a regular basis. When you expect someone to come out a winner it’s sometimes easy to forget what a good designer they are, and for me this garden showed that simple design skill brilliantly. It had strong repeating patterns in the cloud pruned hedging; a very simple structure as its building but the planting was inspired – it was cream, green and purples instead of the whites we often see in a woodland setting. There was a particularly elegant plant called Cenolophium denudatum, a bit like a cow parsley flower, dotted all through the borders that I loved and made a note of. Next to Tom’s garden was the Daily Telegraph garden by Andy Sturgeon, who is one of my favourite designers. This garden didn’t quite have the wow factor associated with some of his previous gardens but it was a characteristically strong design of rusted steel screens and some unusual Mediterranean planting. Andy had created a front border in the garden with virtually no flowers and just foliage, which I still think of as a brave thing to do at a flower show. Many of the plants in this garden were new to me and they jostled alongside common flowers like our native Verbascum. I think he referred to this project as his modern gravel garden and I was thrilled to find out later that he had won not only a gold medal but also Best in Show for this. Just a quick note here for all you fashion experts: whilst I was standing next to Andy Sturgeon’s garden, I got chatting to two blokes, one of whom looked vaguely familiar. We talked for quite a while about the garden, only for me to discover, when someone came up and asked for a photo, that it was Paul Smith and Jimmy Choo! I have to admit that the experience was a bit wasted on me as I would rather buy flowers than shoes, but still at least I didn’t naively ask them what they did for a living! Another show garden worth mentioning was the Eden Project’s Places of Change garden, using more than 53 homeless projects and eight prisons to grow the plants for Chelsea. It was refreshing to talk to guys who had been on the street just a few years ago and now had their lives back together through the involvement of growing plants in community ventures. Of the smaller plots, I was really keen to see the Thrive garden exhibited at Chelsea for the first time this year. Thrive is the main charity to help people carry on gardening when they have become disabled, lost their sight or had a stroke. This garden was designed for an elderly couple who wanted to keep gardening into their old age, and Jo Thompson had designed a very modern looking garden for them. With raised beds and a very attractive sun canopy made from recycled plastic, this was a special little garden and she also won Best in Show for her category, which was great news. I chatted with a few designers during the day who are already gearing up for next year and getting ready to submit plans in a few weeks’ time. If you’ve never been to Chelsea before, put it in your diary to go next year – May 24–28 – but make sure you get your ticket early for this fabulous event.